The Bridge presents current news and analysis techniques related to the latest developments in X-ray based materials science, including news reports, articles and scientific papers. The latest edition of The Bridge, the materials science newsletter from Rigaku Corporation, is now available online on the company’s global website. The Bridge presents current news and analysis techniques related to the latest developments in X-ray based materials science, including news reports, articles and scientific papers. The September 2018 edition of The Bridge contains application papers for energy dispersive X-ray fluorescence (EDXRF) and wavelength dispersive X-ray fluorescence (WDXRF). The new issue includes a featured article about the Graphite/Graphene Analytical Index. 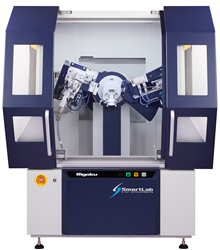 The GG Index is an analytical tool, that runs on the Rigaku SmartLab9 kW X-ray diffractometer, for the characterization and identification of graphite based carbon materials, including natural graphite, artificial graphite and carbon black from petroleum or coal derivatives, expanded graphite, as well as oxides and intermediates. Graphene – consisting of a single, thin layer of graphite – is 1,000 times stronger than steel and exhibits more than 10 times higher electrical and thermal conductivity than metals. The new issue also presents a contributed article about Microgels, soft three-dimensional polymer networks with a diameter of a few nano- to micrometers. They primarily exist “swollen” in water or other solvents. By changing the environmental conditions, microgels adapt their size and shape to the environmental conditions within milliseconds. “Material Analysis in the News” assembles the latest global news stories, including a report about the development, by materials scientists at the UCLA Samueli School of Engineering, of a highly efficient thin-film solar cell that generates more energy from sunlight than typical solar panels, thanks to its double-layer design. The new cell converts 22.4% of the incoming energy, a record in power conversion efficiency for a perovskite-CIGS tandem solar cell. Another news item reveals how scientists at the University of Tokyo have created a magnetic field that is 50 million times stronger than the one surrounding Earth. It is a new world record for a magnetic field generated indoors and, because of the level of control this provides, has major implications for material sciences and the development of nuclear fusion. The book review covers Biological Small Angle Scattering: Theory and Practice by Eaton E. Lattman, Thomas D. Grant, and Edward H. Snell. The book addresses the current theory and practice of small angle scattering (SAS) with sufficient detail for a skilled scientist to successfully begin a study in biological small angle scattering. “Recent Scientific Papers of Interest” – a monthly compilation of material analysis papers appearing in recently released journals and publications – features 21 recently published papers on research relating to materials science.